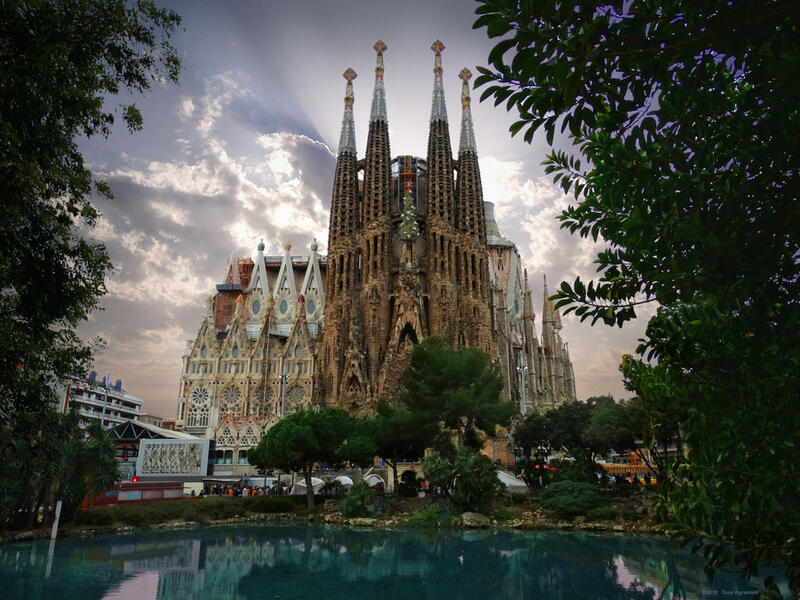 While visiting Barcelona, it is hard to manage a visit of all the touristic attractions, natural beauties, historical buildings or churches into a couple of days. Barcelona and its surroundings offer plenty of activities, breathtaking places and interesting people. It is almost impossible to explore the whole city in one weekend. What you should definitely not skip during your visit to Barcelona are the buildings registered in UNESCO World Heritage Center – and I bet, you won´t regret! Antoni Gaudí – the Catalonian architect, representative for Catalonian modernism and its most important influencer. His work is very creative and individual, includes mosaic, ceramics, window-panes, wooden or mental issues. Combination of these features creates a unique architecture, that you cannot miss while you do sightseeing through the city. Most of his works are located in Barcelona, so let´s look at them! It wouldn’t be a real visit of Barcelona if you skip the icon of this city. La Sagrada Família is an unfinished Roman Catholic church, the biggest work of Gaudí. Its building has started in 1882 and today, after 136 years it is still under the construction! This is probably because of the reasons, that the building is donated solely from private sources and some project´s challenges, that are even nowadays difficult to build. Despite the fact, that the construction achieved the midpoint in 2010, it is still not close to the final view of the church. At the end will church have 18 towers (8 towers are built now) – 12 representing the 12 apostles, 4 representing the 4 evangelists, 1 representing the Virgin Mary, and the tallest and biggest one in the middle representing Jesus. Although the fixed date of completion is not set, ambitious suggestions tell about the year 2026, which represents 100 years from Gaudí´s death. For more information, prices and availability, do not hesitate to visit the website of La Sagrada Família. Hidden from the crowds of tourists, situated in the upper part of the city, offers Park Güell the perfect combination of beautiful artwork and spectacular view to the panorama of the city. The origins of a park are dated in 1900 whereas the official idea was to build a luxurious housing complex with an extensive garden full of plants and trees. However, only two houses were built and after the unsuccessful sale, Gaudí with his family have decided to move to one of the houses. Nowadays is the house (where Gaudí lived for almost 20 years) presented as The Gaudí House Museum with a collection of furniture and objects designed by the architect. While entering the park, notice dominant sculpture of the dragon made of mosaic, a traditional feature of Gaudí´s work. For tourists is the most attractive the main terrace decorated by mosaic alongside its edge. From the terrace is an amazing view to the whole Barcelona and the Mediterranean sea as well, so be sure, that you catch the sunny weather during your visit to Park Güell. For more information, prices and availability, do not hesitate to visit the website of Park Güell. Just a few steps from the well-known street Las Ramblas, in the neighborhood of common buildings and small shops is hidden Palau Güell – inconspicuous building, but in some way really special. You will know, that you are in a right place as soon as you notice the parabolic arch and the iron-patterns on the walls in Seawood and horsewhip patterns. Palau Güell was designated as the luxurious place with exposition rooms, event rooms and apartments. In the past, it was even possible to place the horses in a basement of the palace. The main purpose of the building was to serve as a place to fulfill all the social needs of Güell and López family, who lived here. Today is palace opened to the public and offers sightseeing tours through another masterpiece of Gaudí. For more information, prices and availability, do not hesitate to visit the website of Palau Güell. In the heart of central Barcelona, white building on the corner of a street takes your attention. Casa Mila is called also La Pedrera (“The stone quarry”) because of the fact, that you cannot find any straight wall outside or inside of the building. This style was very characteristic for Gaudí´s architecture – the natural patterns, that are not straight, but creative and diversified. The building of a house was the last Gaudí´s private project made for Pere Mila and his wife, whose name remains in the name of the house until now. The main point of the building is a spectacular terrace on the roof, which underlines the unique style of Gaudí´s architecture. For more information, prices and availability, do not hesitate to visit the website of Casa Mila. In a close distance from Casa Mila is another masterpiece situated. Casa Batlló takes your breath and lets you stand with your mouth opened. The view on it is incredible – it looks as if the whole building is constructed from the small bones of different sizes, colorful mosaic and creative shapes of the walls. This combination attracts crowded of tourist, who visit the house. While standing in front of the house, take a look at the roof. Habitants of Barcelona believe, that the design of the roof is linked to a dragon or dinosaur of Patron Saint Jordí. 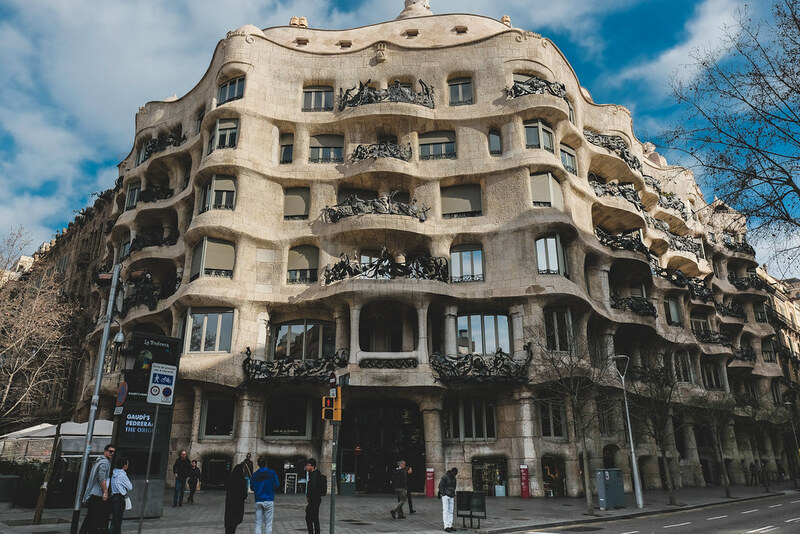 As a result of its rare architecture reminding human´s bones, is Casa Batlló commonly known among the Spanish as “Casa dels ossos” or “House of Bones”. House was opened to the public just in 2002, so let´s step inside and enjoy the decorated interior as well as amazing exterior. For more information, prices and availability, do not hesitate to visit the website of Casa Batlló. Casa Vicens is situated in the neighborhood of Grácia, the heart of Barcelona. Although it is the first house designed by Gaudí, he applied his unique style here already. The house is made with different types of materials – iron, glass, a mosaic made of ceramic, concrete and oriental features as well. Gaudí believed that nothing is naturally straight, what reflects also his work. Intensive, bright colors, floral patterns and natural shapes represent the nature motives. Beautiful architecture is used also in the garden, full of colors, waterfalls and fountains. The house is opened to the public only from 2017, that makes possible for everyone to see the typical Gaudí´s style from both inside and outside. For more information, prices and availability, do not hesitate to visit the website of Casa Vicens. 23 kilometers south-west from Barcelona, in a town called Santa Colome de Cervelló, is another Unesco Site related to Gaudí located. The history of this building is interesting just like the building itself. What the visitors can see now, is the unfinished project of the church, while only the crypt and the church floor were built. Eusebi Güell commissioned his friend, Gaudí, to build a place, where education, a church, recreational and social needs would be fulfilled for the society. With unlimited budget and no deadlines, Gaudí planned to build a church with oval ground and 4 floors, towers of different sizes and central part 40 meters high. However, in 1914 was the project interrupted by no longer funding from Güell´s children. After several reconstructions in recent years is crypt fully accessible. Tourists can even stand on the roof, what would have been a ground floor of the church. For more information, prices and availability, do not hesitate to visit the website of Crypt of Colonia Güell. Lluis Doménech i Montaner was Spanish architect, politician and professor, whose most famous buildings are listed into UNESCO World Heritage Center. He was, together with Antoni Gaudí, the significant influencer of modernism in Catalan architecture. On his building are evident the mixtures of regionalism and ornamental features inspired by Spanish-Arabic architecture, as well as a combination of various material such as iron, glass, mosaic and ceramics. The name of this historical landmark tells what is the purpose of this building. It is not only a place that the tourists can visit. First of all, it is the place where you go to enjoy the perfect combination of excellent music complemented with a spectactular view on sophisticated architecture. The palace was built in 1908 for choral society, who was the main financial supporter of the construction. Its architect, Lluis Doménech i Montaner, was in 1909 awarded by Barcelona City Council for the best building built in the previous year. The exterior of the house creates an interesting contrast with surrounded houses. The main area of the palace is the Concert Hall with 2 146 seats and a glass roof. It is the main place for concerts, recital, symphonic and chamber music. People all over the world visit the concerts and the numbers tell it itself – more than half a million people a year attend the musical performances in Palau de La Música Catalana. 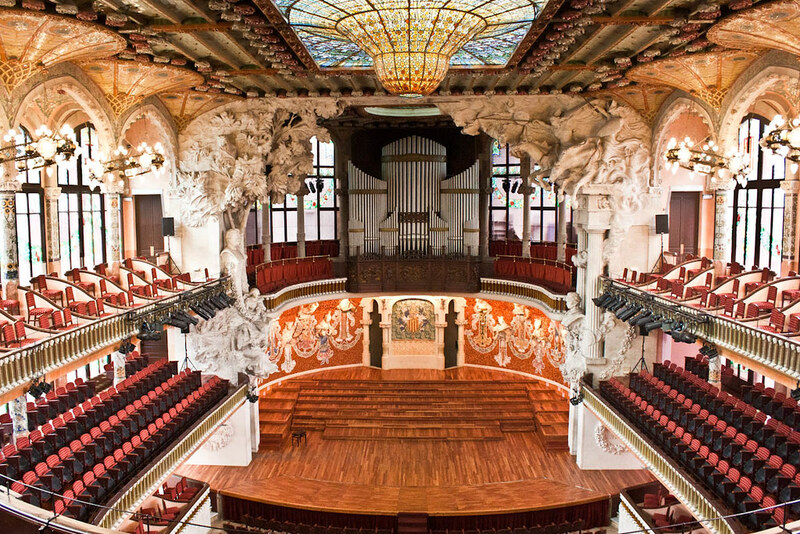 For more information, prices and availabilitiy, do not hesitate to visit the website of Palau de La Música Catalana. The hospital consists of 27 buildings and a dominant entrance building designs in a typical style related to Lluis Doménech i Montamer – red bricks, colorful ceramic walls and roofs. You definitely cannot skip it! The early history of the hospital is dated in 1401 when small hospitals merged. Between 1901 and 1930 was the complex completely designed into today´s look. The biggest change came in 2003 when the new hospital was opened in close distance and almost the whole hospital was moved. Although some parts of the hospital remained in the same place, for example, physical therapist or radiography, the main purpose of Hospital Sant Pau is to set as a museum. Visiting a museum is highly recommend not only for culture and architecture lovers but also for history lovers. There are interesting exhibitions about life, healthcare and medicine in the past and about the history of the hospital as well. For more information, prices and availability, do not hesitate to visit the website of Hospital de Sant Pau.